Eagle Plains, population 8. This is the place to be when they drop the bomb and the zombies crawl out of the ground. At 2360 feet above sea level, the crown of Eagle Plains is The Hotel – a self-contained compound 22 miles south of the Arctic Circle, with a two hundred mile quarantine of Canadian wilderness in every direction. This marks the halfway point along the infamous Dempster Highway; the only road in, the only road out. Everything necessary is here: generators, food, fuel, a helicopter, guns, ammo, fresh water hauled direct from Eagle River and most importantly, a bar. Yes, I would be happy to watch the planet die over a few Yukon Reds with my secretary from up here. This is the final outpost. We are the last humans left in a lonely tower. The Hotel was built in 1978 and hasn’t been decorated since. We walk moss coloured corridors looking for redrum and elevators full of blood, but all we find are grainy photographs of Albert Johnson’s frozen corpse framed under flickering red exit signs. A thinly veiled threat indeed. In 1932, Johnson, AKA The Mad Trapper Of Rat River, was gunned down by the RCMP near here for crimes he may or may not have committed. Nothing was proven, nor disproven, and even his true identity could never be confirmed. But he was weird and nobody liked him. The irksome reprobate had to die. On the way out, he managed to survive two gunfights and 20lb of dynamite before evading the RCMP across 150 miles of Arctic tundra. It was a month from Aklavik to Eagle Plains during the nadir of a northern winter before The Man gained the upper hand and Johnson felt the righteous sting of good old fashioned Catholic retribuse. A commendable effort indeed. The Hotel is much bigger on the inside than it is on the outside. Space and time work differently at these savage latitudes – gravity is denser and the Earth’s magnetic field less stable causing strange disturbances in interior design. No-one would decorate a hotel like this under normal circumstances; it wouldn’t be good for business. But up here, people are at one with the serial killer inside and serial killers are renowned for their, shall we say, unorthodox feng shui. We meander dark halls for hours or days. Lateral pools of light give the illusion of infinity, but infinity is just a circle. Endless doors to empty rooms. So many choices, so few possibilities. If The Hotel ever reaches a 10% occupancy it will be a sure-fire indicator that something really, really bad has happened elsewhere. 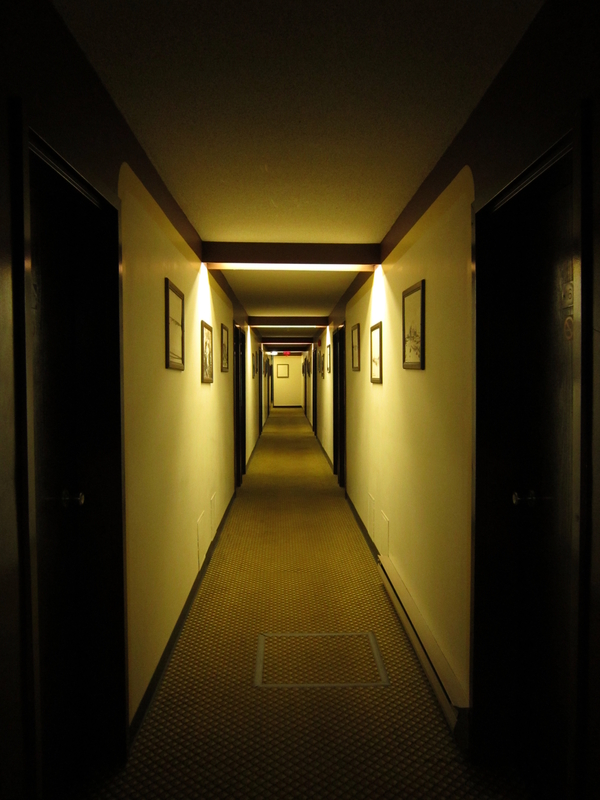 A thin carpet of red mist begins to fill the corridor and strange glowing lights seep out from under the doors to the rooms. We are getting nowhere. Alone in the bowels of extremely expensive budget accommodation. Affordability is an abstract notion when there is no competition. Into shadows. The corridor is spinning like a fairground haunted house. The walls contract and expand as I breathe in and out. This was a bad idea. The Hotel knows everything about me. I’ve been here before. I’ve always been here. After lifetimes, we find ourselves back at the front desk. The fog and glowing lights and dripping things have all gone. The receptionist asks us if we want a room as if she hadn’t just booked us in 20 minutes ago. She smiles a pretend look of confusion when we begin to… she cuts us off to answer a telephone that isn’t ringing. The bar in The Hotel is the epicentre of Canadian heritage gone weird. The counter was taken from the Snake Room of the infamous gambling den, The Whitehorse Inn. Ironically, in 1937 the Whitehorse Inn itself was won from its original proprietors in a bet by a butcher called T.C. Richards. How many fingers were lost here? How many debts had to be paid in meat? Could this be the world’s largest chopping board? A giant chandelier made of antlers swings precariously above our heads and over in the corner a garden of bones has been built around a caribou that didn’t survive the taxidermist. Dead animals everywhere. Bear skins. Stuffed ptarmigans. Disembodied caribou heads. A bald eagle, wings forever spread. There is more dead stuff in here than the bin of Sarah Palin’s abortionist. The midnight sun slithers in through the window from infinities outside. The sun only ever smolders at this latitude and the sky is hazy orange and blue past the valleys and above the Richardson Mountains. Everything happens slowly in the Arctic undaynight and it seems to take forever to get the next round of Yukon Reds in. The last bar in the world. Everyone is here: Albert Johnson’s frozen corpse, T.C. Richards’ collection of mutilated fingers, the ghosts of Sarah Palin’s dead babies, two hollowed out bears, herds of headless zombie caribou, and my secretary and I, but few words are uttered. It just doesn’t seem necessary. The world keeps spinning below us, but the Arctic tundra moves to its own agenda. We sit watching the sun as if it might go out at any minute, but it never does and morning stalks us undectected. So stay at The Hotel at Eagle Plains. Or don’t. But you will, because if you ever find yourself at Eagle Plains, you won’t have a choice.